Well it has been a sad 4 months since my last post. I almost forgot about the blogging world... but I do hope to be better at my updates. One day (and hopefully soon) I'd like to turn this blog into a journal for my family as opposed to just a blog for my fellow bloggers to read and look at. But that takes commitment and that is something I am seriously lacking right now. Just like I totally lack commitment in getting my laundry done. I hate it with a passion. It is the worst chore... I'd rather scrub toilets then do laundry. Pretty sad huh? Well, recently I let it go too far... I will wash and dry the laundry and even sort it into the appropriate owners piles. But when it comes to putting it away... I'm horrible. Don't believe me? Take a look. The first photo is the boys room.... I've been meaning to transfer the clothes into this dresser that a friend gave us for free. And yet I don't ever make the time. 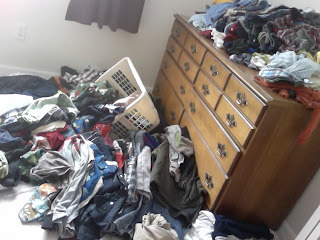 So the dresser sits empty and clothes pile high. 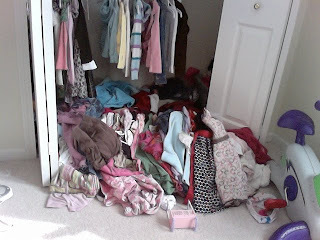 Then there's Bella's closet... she seems to always pull her clothes down to change into them 3 or 4 times a day that finally I gave up and started making clean piles on the floor. But enough is enough... this is hideous and I'm sick of digging for outfits. Time to take charge. Today, I'm going to put all of this away. In the right place and not just on the floor... Wish me luck!